My dad is Arthur Brown. He used to be a second rate game show host. My mom, Crystal, was a second rate junkie. They were perfect for each other. They even got married. Did you know people bet on game shows? My dad did and he worked with the freaking mob to turn it into big business. See, the mob would solicit all the bets and then dad would rig the shows and then they'd both clean up. Dad got caught. The network didn't want a scandal, though, so instead of charging him they just fired him. Everyone knew, though. After that, dad couldn't even get a job hosting a Utube channel. They moved back to Gotham. By then, I'd been born. Mom stayed clean long enough to have me. Dad didn't want any potential legacies ruined by drugs, after all. Dad, meanwhile, refused to work any job that would hire him. He had this whole "I won't do a job that's beneath me" schtick going. So, he ended up going into crime. Turned out he sort of had a knack for planning heists. I grew up in a crap household. Dad was a career crook. Mom was using on and off. You can fill in the blanks. I learned to take care of myself pretty quick. When dad wasn't ignoring me because he was busy plotting and scheming he could be a control freak wanting me to be perfect. Making sure I could read, enrolling me in gymnastics classes, diction lessons. Stuff like that. I actually liked the gymnastics. He even got me enrolled in a private prep school. Probably blackmailed the admissions board or something. Of course, I couldn't dorm there. Then I'd be out of his control. He couldn't have that! * A few years back the capes starting showing up. Good guys in costumes. Bad guys in costumes. Dad saw his chance to be famous again. He made himself a costume and started calling himself Cluemaster. He developed this whole thing about incorporating puzzles into his crimes. He sucked. I turned fifteen and I just snapped. I was tired of it. The constant parade of his loser friends in the house. The total control over my life. It sucked. So, I decided to do something about it. The loser wanted to put on a costume? Fine. I could make a costume, too. He was all about clues? I'd be all about spoiling them. I put on a costume. I called myself Spoiler. I spied on him. I spied on his flunkies. He was so arrogant he didn't even worry about the cops much less his own daughter getting information. And I did. Every time Cluemaster tried to pull off a crime, the cops were there. Or someone wearing a mask. It turned out to be easy. A note delivered here. A spraypainted tag there. A brick thrown through the window of a store the night before to make the owner more vigilant. Every single one of dear old dad's schemes got spoiled. He was in a freaking rage, let me tell you. Eventually, he planned a big score. Something to prove he was the Man. He went out on the job himself, to make sure it was done right. I made sure the cops thought the place he was targeting was in the crosshairs of an Islamist terrorist group. Seeing every badge on the planet converging on daddy's pathetic little heist had me laughing for hours. He's still in prison. Since then I've kept up the night routine. Nothing too big. I find out about crimes through dad's old friends and I make sure they get spoiled. It isn't that I care if some rich chain store gets stolen from. I just think this is fun and more productive than being a loser criminal like my dad. Guess I'm an addict, too. 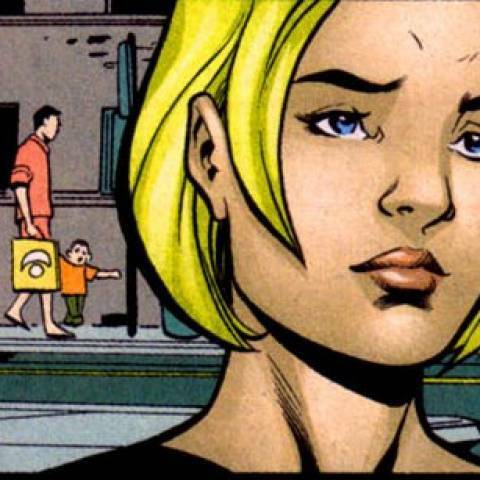 Stephanie Brown is stubborn. You know that kid who, if you tell her the sky is blue, will insist it is pink and then argue with you for weeks? Yeah, that's her. Stephanie hates giving up. She hates failing and she hates accepting that she isn't right. This can be a positive trait - after all, she won't give up the costume no matter what cop, cape or social worker her tells her to. But she also won't quit when she should. Stephanie's an adrenaline junkie. She even knows it. She loves the rush that comes from leaping off rooftops and busting one of her dad's schemes. In a way, she's as much of an addict as her mother. Except her drug of choice is one her body produces naturally. Stephanie suffers from Peter Parker syndrome. She never lets silence say something when a good quip can do the job. Her tongue's fast and sharp and she loves using words to confuse, befuddle, and humiliate. And she has a thing for puns. She won't admit it, but Stephanie takes after her father. She's got a good head for strategy. She understands the dynamics of patterns and knows that you can nudge here, whisper there and entire plans can fall apart. Give her enough information and Stephanie can probably plan a course through any scheme. Yeah, Stephanie's got anger issues. You would, too, if you lived the life she had. What it boils down to is she's got buttons and, if they are pressed, she's more than happy to respond with malice of words of violence of arms. 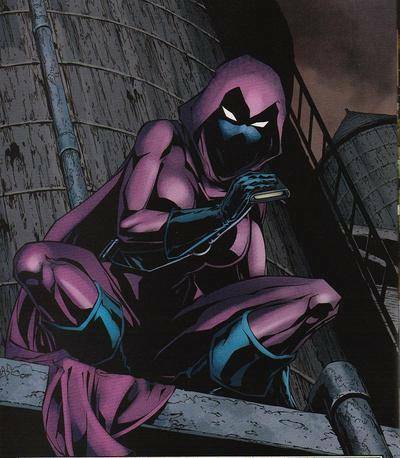 Stephanie Brown's primary motivation is to ruin her dad's plans. With him in jail she's a bit out of sorts. She's searching for direction in her life, though she'd never say so outright. Right now, she's motivated by her next thrill. Screwing over criminals from the shadows. But eventually she'll need purpose. Number one? Ruin dad's life. Number two? Have fun and not just typical teen fun. Running along rooftops and busting crooks. Oh, and she should probably finish high school and get into college and figure out the rest of her life. Stephanie wears a small, personal cloaking device that her father stole from a garage inventor in Gotham. The device doesn't turn her invisible but instead blends her into the background, Predator style. It works beyond the visible light range, extending into the infrared and ultraviolet - it blends her heat signature as well as her visual signature. The device does nothing to block out other senses, however. Stephanie calls them her spoilers and she stole these from her father, too. Essentially throwing discs, each has a specific function: bang, boom, brrr, goop, zapp, gasp, woosh and foosh. Bang discs are weighted and do blunt trauma damage, enough to knock a grown man out if it hits him in the hear. Boom discs explode on impact and are powerful enough to put a five by five foot hole in a brick wall. Brr discs release a quick freezing compound that can surround a six foot tall target in a layer of ice roughly one inch thick. Goop discs release a clinging gel substance that robs targets of intertia, enough to slow a regular man to a crawl. Zapp discs produce enough electrical charge to knock out a grown man or short out a fuse box. Gasp discs release a smoke cloud that fills a ten by ten by ten foot area with a gas that obscures visual sight and muffles sound. Woosh discs separate to create a bolo that will entangle a target, with wire strong enough that it requires super strength to break it. Foosh discs release a concentrated acid strong enough to eat through a one by one foot, one inch thick steel plate. Stephanie's got a nice stash of gadgets stolen from her dad - all the basics a budding crime fighter needs. Grapple lines. Lockpicks. Climbing claws. IR goggles. Listening devices. That sort of thing. All of it is roughly on par with what is available to special operations units. Stephanie's stubborness translates into willpower. She's had crap thrown at her all her life and she's survived. She doesn't give up. She doesn't surrender (unless it makes strategic sense) and she refuses to believe she can't succeed given time and effort. She's not the next Batman but Stephanie's like Rocky. Knock her down and she will get back up. 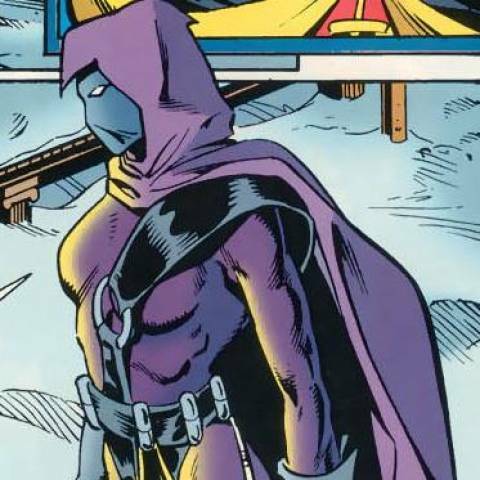 Cluemaster's friends and lackeys have no idea Stephanie Brown is the reason that Arthur's plans so often went wrong. Or why he's in jail. They just know her as Arthur's little girl and a little guile can get them to share all sorts of interesting information or expertise. Stephanie's been studying gymnastics for years. Her coach both loves and hates her because Stephanie could be Gotham Prep's ticket to the finals… if only she'd stop skipping practice and the occasional match. In short, Stephanie's quite the skilled gymnist. She's also got years of practice in the sport called parkour: running over rooftops, climbing up and down walls, leaping over obstacles and such. The perfect sport for an urban vigilante. 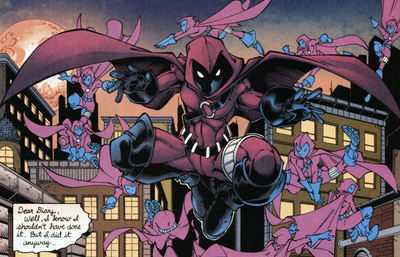 Stephanie Brown doesn't have a half-dozen black belts in various martial arts. What she has is years of brawling experience. Life wasn't easy growing up and if you didn't learn to fight back in the neighborhoods of Stephanie's youth you probably ended up dead. So, she knows the ins and outs of dirty street fighting. She can hold her own against similarly trained individuals but against a true martial artist she'll start having problems. Stephanie has a good and clever mind. She's the sort of person who has a natural aptitude for chess. In other words, she's a planner. Stephanie's capable of putting together strategic plans for heists, battles, and missions. As of now, this ability is untrained but even then, Stephanie's capable of beating three out of five chess players. Stephanie's not bad at school. Specifically, she's got a flair for history, English, and math. In those three subjects, she's on the same level as any high school AP student. When it comes to other subjects, such as the sciences, she's much more average. As a modern, teenage girl, Stephanie's conversant with modern communication technology such as smart phones and the internet. She's no hacker but she knows how to find stuff via Google and how to subvert most of the well meaning restrictions put on tech to keep teenagers from getting into "trouble" on the internet. Stephanie's dad is Arthur Brown aka the Cluemaster. A career, costumed criminal who never quite hit the big time, Arthur's on the edge of insane and obsessive. He's more than willing to use Stephanie as a tool in his crimes or, worse, to cause her harm because she's opposed to his schemes. Stephanie is seventeen and still in high school. While access to a fake ID isn't hard to come by, anyone doing a background check will find out she's not old enough to vote. This can limit her options when it comes to investigating crimes or if she's picked up by the cops. Despite her capability as a planner, Stephanie's got buttons and, when they are pushed, she leaps before she looks. As Stephanie's anger rises her rational abilities fall. In other words, if she gets upset, it is easy to push her into actions that might be detrimental to both her plans and her health. Stephanie's got her some attitude. She's stubborn and she refuses to back down. She doesn't know when to quit and tends to run off at the mouth when she should show deference. The more she's pushed, the more stubborn she gets. Anyone who has ever handled teenagers knows this could lead to a bad situation.